The 2013 Spring Board of Directors Packet is available to members at the top of the BOD meeting agenda and minutes page. IAC Aerobatic Schools Liaison and founder Miriam Levin has resigned due to increasing demands for her talents. IAC South-Central Region Director Lynn Bowes has accepted the role. 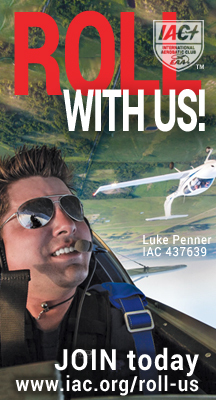 EAA/IAC Webinar 2013 Presenters Needed! The IAC has joined the EAA in providing speakers to present material online at the EAA webinar series. IAC has provided presenters every month since June 2011. We are excited about the added value this brings to the EAA webinar series as a club, sharing valuable information about unusual attitude flying and gaining some exposure for the IAC as part of the EAA. We are currently booking speakers for the webinars in 2013. The time slot is typically on a Tuesday or Wednesday at 7pm CST during the 2nd or 3rd week of each month. Visit the download page to get the new rule book for 2013.